Every month I put flea medicine on Speckles. Two days later I give her a bath. She’s not difficult to bathe. She will just stand there, turn when told, then stare at me with these big, sorrowful eyes. It’s as if she’s whispering to me, “Why? Why are you doing this to me? Don’t you love me anymore? How much longer must I endure this?” She seriously knows how to guilt-trip a person. Giving our dog a bath is never any fun but a fur baby parent has to do what a fur baby parent has to do. Fortunately, I got a break this time around thanks to the dog grooming services at Petco Grooming. Petco has a completely separate area just for dog grooming. Though walk-ins are welcome, I decided to call in for an appointment. The stylist asked for our dog’s name, my name, my phone number, and what type of services we wanted. I chose the full-service bath. This includes a shampoo, blow dry, 15-minute brush out, ear cleaning, nail trim, gland expression, and scented spritz. I didn’t need her nails trimmed since Speckles REFUSES to have her nails cut by anyone (I have to file them at home every 1-2 weeks). That wasn’t a problem at all and the stylist even offered to brush her teeth instead. Score! That just happened to be the one extra option I was hoping to ask for anyway! Since Speckles is losing her coat for summer, I also ordered a de-shedding treatment. The only hiccup was that I forgot when Speckles last had her rabies shot and hadn’t updated her file at Petco. The stylist offered to contact our vet for the update and we were good to go. Our appointment was at 10:30am Thursday morning. As soon as we arrived, the staff was all ready to take Speckles. The dog grooming stylist on duty came out to greet us. She did a quick inspection of Speckles and then brought her to the back. We went over the desired services again just to be sure we were on the same page. 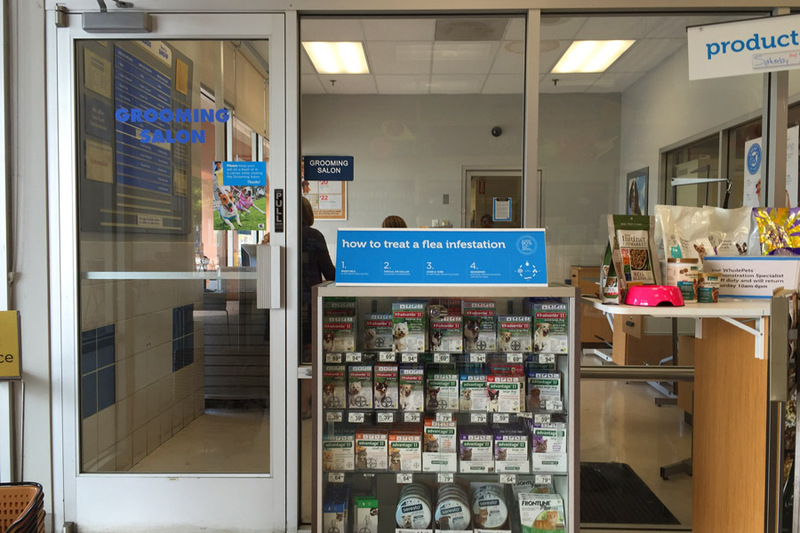 Though dogs are bathed in a back room, brushing and other services happen in the front area. 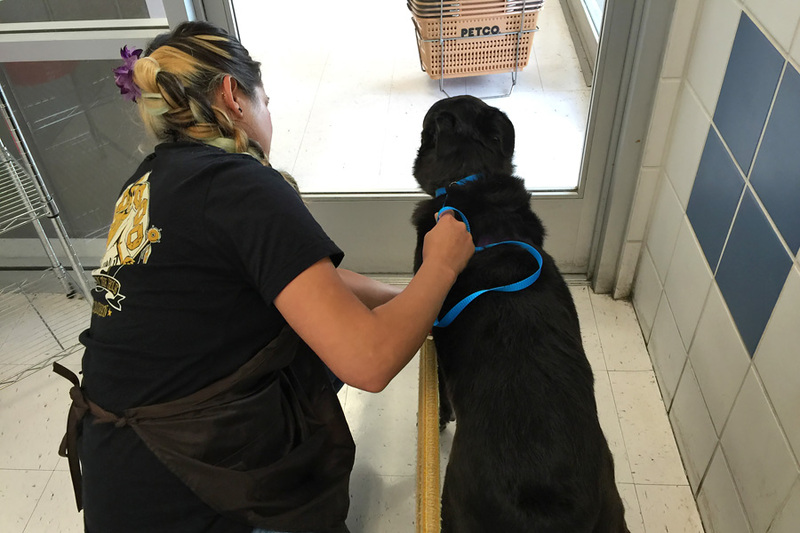 Pet parents can stay to watch their dogs being groomed there, if desired. Since I had a busy weekend to prepare for, I opted to leave Speckles in the stylist’s capable care. 1-1/2 to 2 hours later, just as promised, I received a call that Speckles would be ready in five minutes. I was still nearby and walked in shortly after. The stylist handed me the final bill and said I could pay at the main register. Since it was the first time I had Speckles groomed there, the stylist decided to give me a discount. What a nice surprise! Then I walked back into the dog grooming area. They brought Speckles right out. It was so nice to not have to wait around! The stylist then handed me a bag of treats, coupons, a service summary, and a discount for a friend we might refer. I couldn’t believe how quick and easy the whole process was. 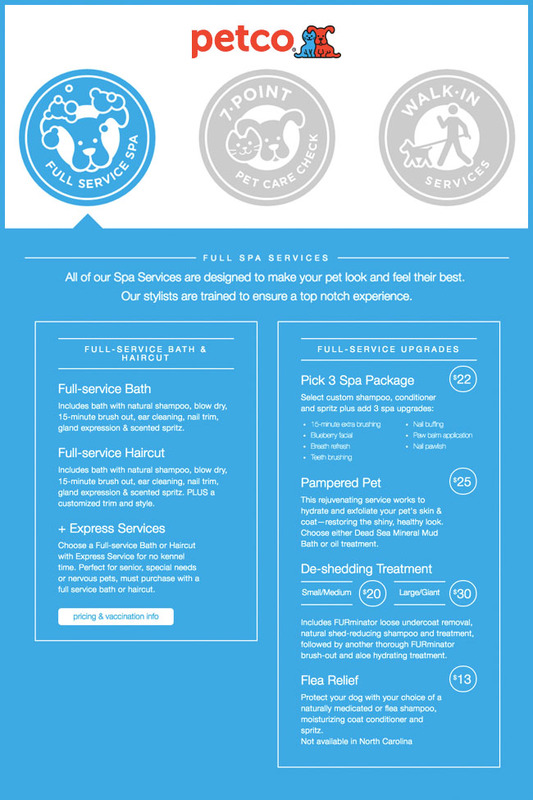 We definitely had a great experience and hope to book this stylist and the same dog grooming services again soon! 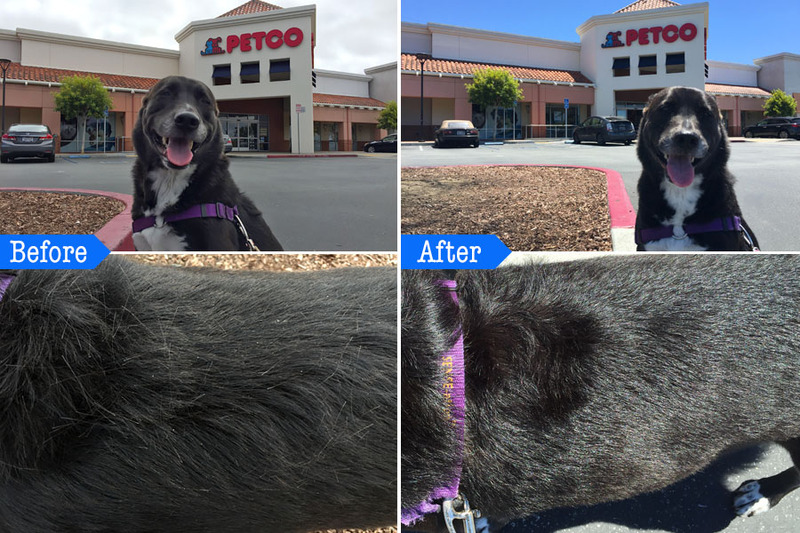 If you’d like to check out the Petco Grooming near you, just visit this page. You’ll find a full list of service including extras, prices, and current specials. The only thing left to do is call the store for a price quote on the bath or haircut and book your appointment. Easy peasy! So what are you waiting for? To sweeten the deal, here is a special giveaway in which you can win one of two $50 gift cards for sharing and/or commenting on your post. Enter below! 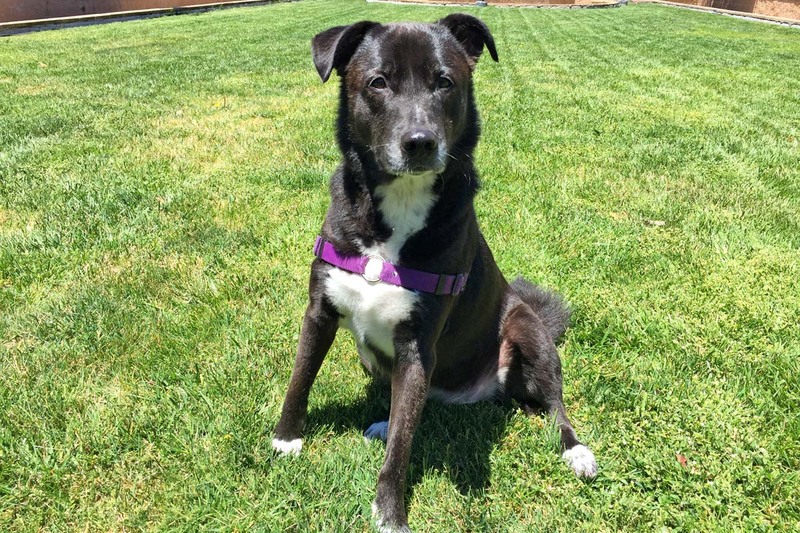 This blog post is part of a paid Megan Media and #PetcoGrooming blogging program. The opinions and ideas expressed here are my own. A messy moment would be when our yellow labrador decided to go “swimming” in a massive mud puddle when we were hiking! We have a labradoodle named Coco. She’s a naturally messy dog. Her latest trick was to empty the trash can while we weren’t home, which resulted in a messy dog and a messy kitchen! Wow his coat looks great. So shiny now!